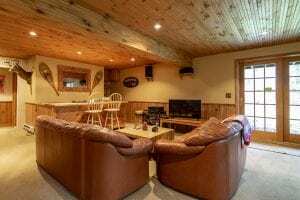 The Adirondack Chalet is a lovely 5 bedroom Lake Placid home tucked in a wooded setting that could have enhanced views with selective tree trimming. This home was totally renovated in 2004 and has an open floor plan with hardwood floors in the kitchen, living room, dining room and sunroom. The new kitchen has high end stainless appliances and there is a cathedral ceiling in living room. The main floor holds 3 of the bedrooms and 3 full baths. The lower level holds 2 more bedrooms, a full bath, an office and the spacious great room complete with wet-bar, ideal for entertaining! There is a 2 car attached garage and a wrap around deck with plenty of space for everyone to enjoy the outdoors. 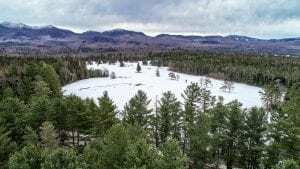 The house is conveniently located across the street from the Lake Placid Club Golf Course along with the Jack Rabbit Trail for several miles of cross country fun and is also within walking distance to the Village Center. 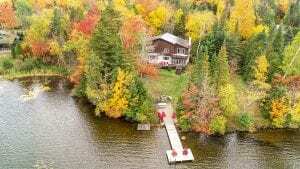 The Mirror Lake Chalet is situated on a large lot with 170 feet of private waterfront and a newly built custom dock. There are 4 bedrooms, with one of the bedrooms so sizable that it could easily be split into 2 bedrooms. 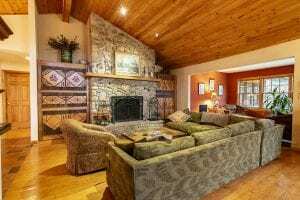 The living room features high ceilings, wood beams and a lovely wood burning stone fireplace. 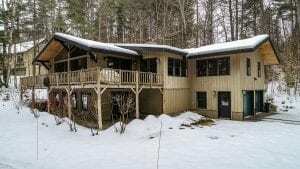 The year round den/sunroom is just steps away, offering a perfect gathering place facing the lake. The kitchen has an oversized island with breakfast nook and the dining room sits between the kitchen and living room. 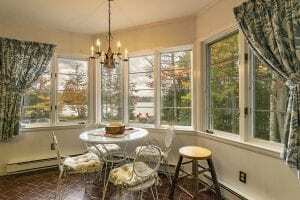 Several large windows face the lake offering nice views throughout the home. 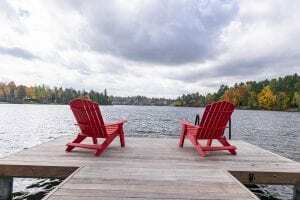 A large deck with built-in seating spans across the entire back of the house and overlooks the lake with all day sunshine. The professionally landscaped grounds have extensive mature, perennial gardens with huge ostrich ferns and the level lot with large backyard. The backyard has a lakefront outdoor stone fireplace and dock. This home is within an easy walking distance to town along a quaint brick sidewalk lakeside, but there are no village taxes! 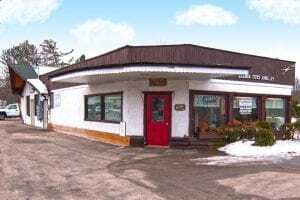 A commercial building located in a prime corner location on Saranac Avenue in Lake Placid. The building currently has 3 separate operating businesses. There is a hair salon, a music shop, a massage therapy office. Also, there is an off-road, private and paved parking lot. 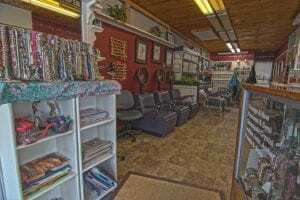 This property is ideal for any type of business. If a buyer wanted they could opt to tear down the building and rebuild a new one in its place. The building is in a very visible location alongside a main road leading into the Village. 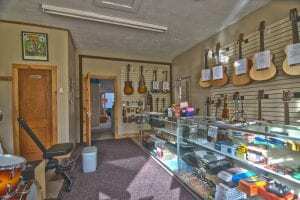 This business is also within walking distance to the Village Main Street and lakes.